A new year means that is time again for resolutions! Of course there will the usual suspects &ndash; you’ll want to exercise more and eat better, spend more time with family and friends, save money, etc. But we have four resolutions for you that maybe you wouldn’t think of on your own! Did you know that some insurance companies use your credit information as a factor in determining your home and auto premiums? The better your credit score, the lower your premium, and the more money you save. Put down you cellphone and pay attention to the road. Distracted driving accounts for 11% of all fatal crashes involving drivers under the age of 20. If you could significantly cut your risk for accident, wouldn’t you? Just hang up. Ask us about the different safety and security discounts we offer on our home insurance! Thinking about adding a security system? Do it! Replacing an old roof? Do it! The safer your home, the better the rate we can offer you. This is particularly important for those of you with high value homes. It’s better for the environment and it’s better for your pocketbook. If you are a part of a pay-as-you-drive program then you can save more money by cutting down on your mileage. Carpool, bike, whatever &ndash; just consider other commute options. 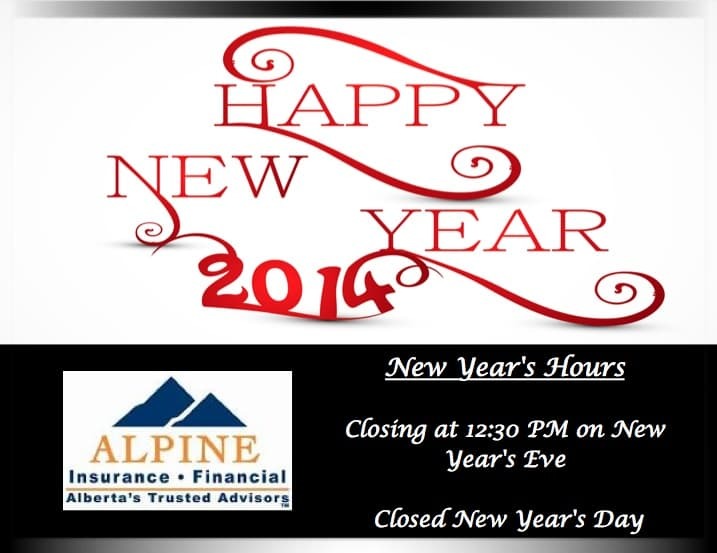 Alpine Insurance and Financial wishes you a Happy New Year!